Warak - REANIMATE [Taiko|OsuMania] · forums · community | osu! 00:22:091 (53) - Although kddkddd looks more common to use I'd say to go with kdkkddk to support the lighter sound at 00:22:091 - . 00:44:677 (62,63,64) - the concept of using kat notes only for this section looks neat but then again, these three don note falls out of that while there are no bigger differences. change them to kat notes. 01:41:401 - pretty minor but the SV transision is smoother if you would add 0.85x here. I will be back later to mod Futsuu/Kantan. 01:41:746 - 01:51:401 - my 2ct but undermapping so much isn't really necessary. I think there is enough room you could use some neato pattern. 00:26:229 - 00:46:573 - having Kantan and Futsuu nearly equal looks odd to me, I suggest removing notes such as 00:26:918 (36) - , 00:29:677 (40) - and 00:34:504 (49) - . and basically what I have wrote before for Oni and Muzukashii. Also, it seems that some notes in the Mania difficulties are unsnapped? 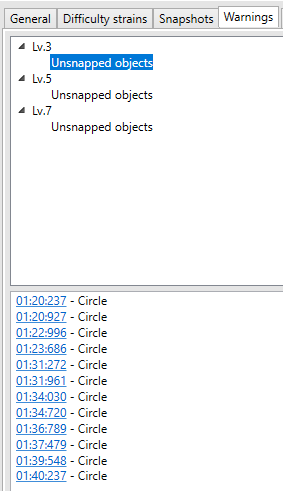 https://derpovic.s-ul.eu/oAyPmsAZ.png I mean from what i saw they are snapped to 1/8 (for whatever reasons??) but err, I have mentioned it, just to be sure. 00:52:953 (52953|0,53125|3,53298|1,53470|3,53470|0) - Likewise ^, since there's no LN though, you can just remove 00:53:298 (53298|1). 00:54:160 (54160|0,54332|3,54504|1,54677|2,54849|1,54849|3) - Same as above. 01:55:539 - It's fine but you could go for LNs here. You should implement more LNs in the section before the first kiai, so it's less of a 1/1 snoozefest, in places like 00:27:953 - 00:38:987 - and I guess anywhere else with a held vocal without going too overboard. You don't have to commit to making this section LN, just make it a little more varied. 01:16:918 (76918|0,77493|2) - Fairly certain this, and the next 1/3rd snap should be on the 1/4th blue tick instead, these sound too early. I might be wrong though, so double check. 01:46:142 (106142|1,106229|3) - Move this to 4-1 for PR. 02:29:332 (149332|0,150022|3,150367|1,150711|0) - Same as in Lv. 3, rearrange for pitch please, apply to the later diffs as well. 01:51:401 (111401|0) - Not a fan of extending this LN past 01:53:125, the strings held note cuts off here and having the same LN represent two different sounds (i.e. violin and the quiet build-up synth past 01:53:125) isn't something I can approve of. 02:30:367 - If you're going to have doubles in this section, then the last two notes should be triples to compensate. Will get someone to run through the harder diffs for me, call me back when this is applied so we can get this set underway. add Gezoda to tags, because name change. a bit rough to use OD6 for this Oni, might using 5~5.5 max instead. fix SV via notepad, it's bugged to 1.3999.. change it to 1.40. I really don't see the need of HP6 here, nerf it down to HP5. Nerf the OD to 4. 00:32:780 (55) - move the note to 00:33:125 - , by far a stronger sound you could follow and provide a better break phase. 00:57:263 (114) - might skip this note to break off the relatively long combo chain. eally don't see the need of HP6 here, nerf it down to HP5.